Grand Theft Auto creators Rockstar Studios have released their second teaser trailer of the fifth series, Grand Theft Auto V.
Even though we’ve still got a couple months wait on our hands before we can grab hold of the new game, Rockstar is compelled to upload teasers of Grand Theft Auto V to YouTube. Instead of just an first trailer, this one has a lot more show-and-tell of the characters. Tapscape already found out a lot of features we are likely to see from IGN and other gaming sources. The trailer shows a lot of new design features and experimental ideas that the Rockstar team have with Grand Theft Auto V, including animals being on the game. As we’ve already reported, there will be multiple players that you can play as on the single-player campaign and these will come together for various missions. You can change who you want to play as at most any time either outside or on a mission. Outside all the new features, we are going to have the same sort of out-of-control, over-the-top, humorous and exciting storyline with tons of battles, brawls and pilot chases. Rockstar have said that Grand Theft Auto V will be like the mission ‘Three Leaf Clover’ on Grand Theft Auto IV, apart from instead of one mission, most every mission is as exciting, as well-structured and as fun to play as that. Rockstar have also said that they have been working a lot to recreate how open world games are played. On San Andreas, you could work at the gym, buy clothes and houses, they took that away on Grand Theft Auto IV, we hope they bring those back with more to do and spend. 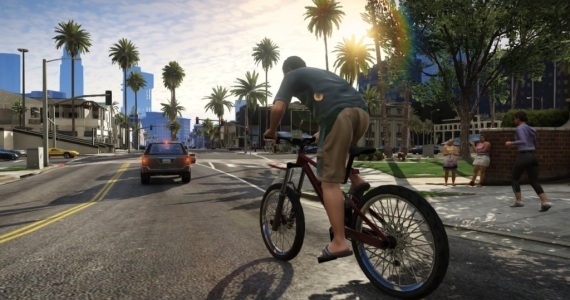 Grand Theft Auto V comes out sometime in Spring 2013, we believe it will March time, although we are unsure for the moment.